I celebrate all police forces, as the men and women who put their lives on the line every day, for security and safe keeping of communities. Being safe, we take community safety for granted, it does not come that easy. First and foremost, our law enforcement officers do the jobs they do because they are committed to serving others. They love where they live, and they want their communities to thrive. The officers are people too. Sure, they’re part of something bigger than themselves, but when they take off the blue, or black, or brown uniform, they’re just like us. They have the same hopes, dreams, regrets, and worries. They have moms and dads, brothers and sisters, husbands and wives, and sons and daughters at home. They’re human beings who are elevated by their willingness to sacrifice. “the most sublime act is to set another before you.” When our law enforcement officers go to work each day, that’s the affirmative decision they make: to set others before themselves. The police departments moto is “to protect life and property and enhance the quality of life for all citizens.” LAPD’s moto is “dedicated to preserving life, maintaining human rights, protecting property, advancing education, and promoting individual responsibility and community commitment.” NYPD “Committed to Excellence in our Community,” . The fact is that our local law enforcement officers can’t know what new challenges they’ll encounter or what new threats they’ll be expected to confront when they’re on the job. Every community needs leaders—people for the next generation to look up to—and that’s a role that law enforcement officers of LAPD are well-suited to fill. We as Angelinos need to support them, they deserve public support, because Their courage. Their commitment. Their instincts. Their nerve. Their devotion to their families as husbands and wives and fathers and mothers. Their insistence on always doing the right thing, keep their communities safe, and more than anything their humility. It is an honor and privilege to have known Chief Moore for a few years, and his leadership qualities can inspire all LAPD to accomplish amazing things for our great city of Angeles. 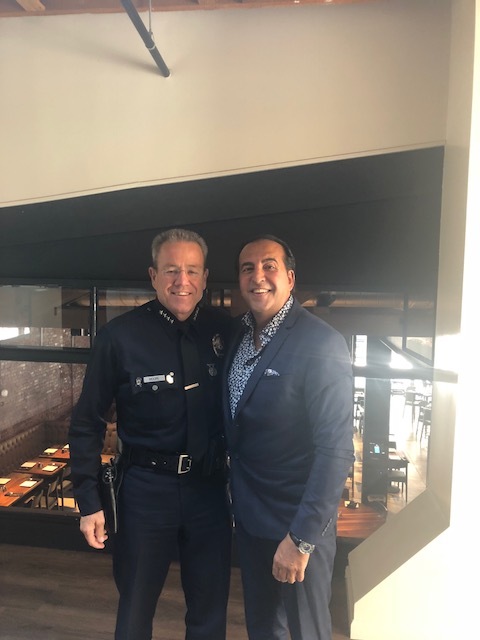 I had the honor to meet Chief Michael Moore as the chief of Los Angeles Police Department, and talk about community’s needs, On Tuesday September 4, 2018. On this September 11 Today, 17 years ago.